Please take a moment to answer the following question in the comments section below. It's a fun way for us to get to know each other a little better. What is one thing you've learned in the first half of this year? Please take a moment to answer the following question in the comments section below. It's a fun way for us to get to know each other a little better. What makes a person beautiful to you? Please take a moment to answer the following question in the comments section below. It's a fun way for us to get to know each other a little better. With Father's Day coming up in the USA this weekend, what is one of the things you enjoy/enjoyed doing with your father or any other male that has played an important role in your life? Please take a moment to answer the following question in the comments section below. It's a fun way for us to get to know each other a little better. If your mind had the capacity to retain only three images, one each of a person, a place, and a thing, what images would you choose to keep? 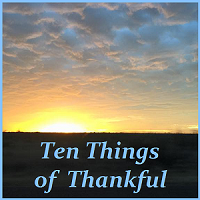 Welcome to Ten Things of Thankful... and a new month begins! Please take a moment to answer the following questions in the comments section below. It's a fun way for us to get to know each other a little better. Do you plant any flowers or vegetables? What is your favorite thing to grow?